The restriction appears to only be effective against the @RealAlexJones account, which has 890,000 followers. 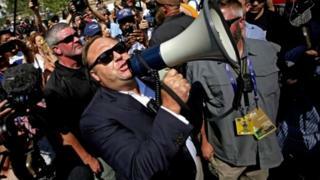 Mr Jones has since posted a video in which he discusses the move to a separate @Infowars feed – with about 431,000 followers – which he described as being a “sub-account”. They include the social networks Google+, Gab and Tumblr. In addition, Google’s Play store and Apple’s iOS equivalent continue to host the InfoWars app.